It is my honor as Chairperson of the Sisterhood Nominating Committee to place into nomination the attached Sisterhood slate of officers and board members. In choosing the nominees, the Committee worked with great thoughtfulness and have brought together this leadership team of dedicated and visionary women. We thank the nominees for their willingness to devote their time and energy to the B’nai Amoona Sisterhood. I would like to thank the Sisterhood Nominating Committee for their dedication and thoughtful deliberations: Gail Feldstein, Diane Friedman, Marla Goldstein, Elise Krug, Marcia Lyons, Rhonda Oberman, Robin Shulman, and Elizabeth Wright. The new members will begin service July 1, 2019. To strengthen and unite the women of Congregation B’nai Amoona as they work, learn and grow together through Jewish programs, worship and fundraising; perpetuate Jewish family, synagogue and community life; support the congregation and all congregants; enrich Jewish education and ties with Israel; and reinforce the understanding and perpetuation of Conservative/Masorti Judaism. Through education, service and practice, the Sisterhood of Congregation B’nai Amoona will do our best work for our synagogue to maintain our Jewish traditions, heritage and values now and for future generations while balancing health, family, work and community. 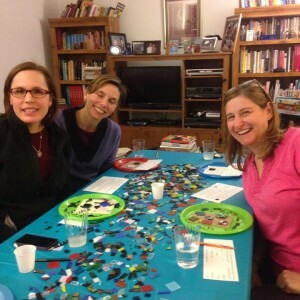 How can you help the B’nai Amoona Sisterhood? The B’nai Amoona Sisterhood is dedicated to keeping alive the ideals of Conservative Judaism through a variety of educational, cultural, religious and social programs. Join us at one of our events, help us cook, volunteer at the Judaica Shop, stuff envelopes, or join a committee. 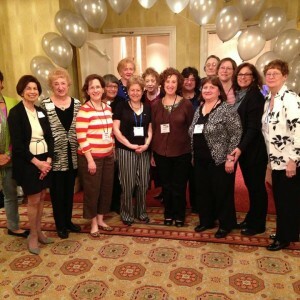 How can the B’nai Amoona Sisterhood help you? Sisterhood & Men’s Club Program, December 5 - The Blessing of Assimilation. Standing at the Precipice: Imagining our Jewish Future Click here to RSVP! Join us as we explore, in conversation and discussion, rather than lecture, a little about our Jewish past and then about our community's future social, emotional and spiritual aspirations. And by community, we mean the Jews at B'nai Amoona, in St. Louis, America, Israel and the world. We plan, over the course of the year, to bring in a multitude of guest Rabbis, teachers, artists, writers, etc. to join us.